We’ve talked about weaving a bit on the Berroco blog—it’s a great way to take a break from knitting and crocheting while still being able to play with yarn! Woven fabrics can be used in a variety of projects, and weaving patterns yield endless inspiration. But if you’re just thinking about dipping your toes in the weaving waters, we have a great opportunity for you to win an Intro to Weaving kit. Small looms, such as the pin loom or rigid heddle looms, are the perfect introduction to weaving. They’re typically low-cost and there’s a lot of pattern support and inspiration available for them. One such source is Interweave’s special weaving issue, Easy Weaving with Little Looms. Both this year’s edition and last year’s offer tips and tricks to get you started weaving with small looms, along with patterns for weaving projects to make with those small looms. 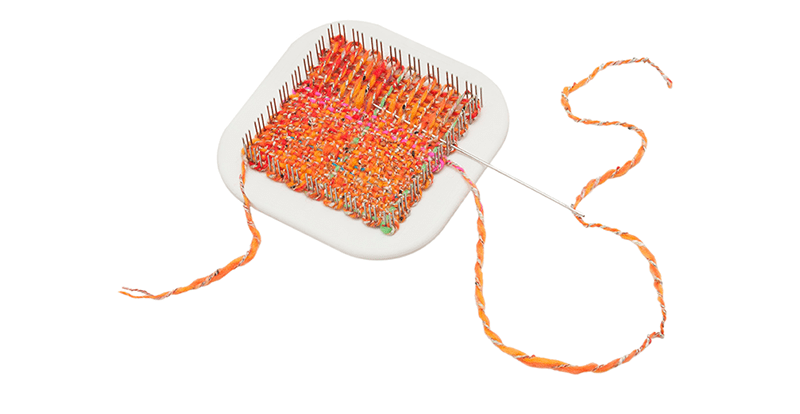 One such project is Angela Tong’s Pin-Loom Clutch, worked on a Schacht Zoom Loom with two colors of Berroco Cotolana™. We’ll have a blog post from Angela later this week, providing more information about her cute little clutch purse. The Schacht Zoom Loom is a great way to learn the ins and outs (pun somewhat intended) about weaving. This pin loom is a complete package—you get the loom in a convenient carrying case, the weaving needle, and even a little bit of yarn to get you started before moving on to bigger and better projects, like those you would find in Easy Weaving with Little Looms. Thanks to our friends at Schacht and Interweave, we’re giving a way a weaving starter kit! One winner will receive a print copy of Easy Weaving with Little Looms, a Schact Zoom Loom package, enough Berroco Cotolana to make the Pin-Loom Clutch (you choose the colors), all in a Berroco project bag! Want to win? It’s easy! Giveaway is now closed. Willow & Sycamore – colors that will go with my wardrobe. I would use the colors madder and cypress. I have been wanting to try weaving in a “little” way. So many beautiful colors to from…maybe Beech & Madder. Birch and maple, I think it will pop in a weaving!!!!! Beech and White Pine would be my choice. I would choose Beech 3544 and Sycamore 3506. I would use cypress and birch. I love orange! Beech and Elm for me, both trees I love! Elm & Cypress – beautiful colors. Witch hazel and willow please. Hawthorne and Sycamore look good to me. Beech and Elm are my favourites! I would use willow and mapple. My mom had one of the original models and I have asked her what she did with it and her response is how do i know that was 50 years ago. Happy to see others partaking in the fun. I would use Beech and Witch Hazel to match the dress I will be wearing at a forthcoming wedding! I really like the colors: Sumac and Sycamore. I remember my Great Grandmother having a mini loom. I’m not sure she ever made anything with it but I really wish now I could go back and find it. Hm, torn between Madder or Hawthorn combined with Willow or Sycamore. Birch and willow. The colors of my land. I’d go with Madder and Maple. I have a floor loom that I have never set-up or learned to use. I would love to get my feet wet with a portable loom. Time to get back to weaving, perhaps. I would choose willow and cypress for an interesting color combination. I think I’d like the contrast of Birch and Willow. I think Maple and Birch would be perfect! I like witch hazel & sycamore. Beech and Sycamore would be awesome! I would use Balsam and Willow, and I know its a third but a little shot of Cypress here and there for a boost. Silver or white with black would be my choice, so I could use it with many outfits. Such lovely muted colors. I would use Hawthorne and Madder, but I had a hard time deciding. I would use Balsam and Sycamore. what a FUN package of goodies to win for someone!!! I would use Willow & Balsam!!!!!!!!!!!! Oooo-I really like balsam and beech! I would like to make one in Willow and Sumac. These colors are sophisticated, yet fun together! I would use Willow and Witch Hazel. Sumac and witch hazel. Very cool names LOL. Balsam and Birch would be my choice. I’d love Madder 3515 and Hawthorn 3548. I love earth tones, brown like the earth and blue like the sky. sumac and willow would be my choice and I see I’m not the only one! For me: Cypress and willow! I would use Birch and Sycamore. I think that would be a nice neutral but interesting mix. Thanks. Witch Hazel and Elm would look beautiful together! I would LOVE to have my very first Berocco yarn. I love the colorway Sumac and balsam. All the other colors are so beautiful too. And a Zoom Loom looks so much fun. Thank you so much for a fantastic giveaway. Hawthorne and Sycamore. Truly a beautiful use of yarn! I would love pink and purple. It’s spring! I’d use a subtle combination of 3510 Maple and 3503 Birch, and add just one square of 3548 Hawthorn as a highlight. Would love to win the loom. It would be a great new learning tool for the summer after knitting all winter. My colors would be Beech and White Pine. Thank you for t his opportunity. I would love to use beech and cypress to try a new little loom craft!!! A nice break when my hands may hurt from knitting too much! For a start, I’d go with Madder and Maple. I have been wanting to try weaving for some time now– thank you for the great recommendations for the initiate…. I’d love to make the little clutch in sycamore and sumac. A fun splash of reddish pink goes with just about anything!!! I like Madder and Willow for the contrast. My teenage niece would have fun making projects with this loom. Maple and sumac look like a great combination. I would use both Birch and Maple colors to make a neutral clutch to be used both summer and winter. I’ve got a big loom, a little one would be fun to explore. Hawthorne and Maple look good at the moment. I really like the sample colors. But I’d also make one in neutrals like willow and birch. They’re all so pretty! But I think Birch and Beech would look amazing! ooh – LOVE this little clutch! I’d make mine in Cypress and White Pine. Cypress and maple for that fall feel. I love beech and hawthorne! Love them all but I’d use Sumac and Beech. Sycamore and Willow look my speed. I would use Beach and witch hazel. I absolutely love that clutch. Great giveaway! I would use sumac and madder. Birch and Maple or Beech and Witch Hazel. Love the subtle colors! Sumac and Cypress would be the colors that I would use. Reminds me of my potholder making days!!! I am not the least bit Scottish myself, but they have a wonderful weaving tradition to celebrate, and music that makes a lively companion for any fiberwork. I would love to use witch hazel and birch Berroco Cotolana on the Schact Zoom Loom. Beech and sycamore go well together and the bag will be fun to weave. I would love beech & maple although there’s so many lovely colours to match or contrast, it was a difficult choice. I haven’t done any weaving since my school days so this would be a great opportunity to give it another go. Hi Julie! You’re one of our prize winners—hope you love getting back into the weaving groove! Please check your email. Sumac and Beech would be my choice! That seems like summer to me. When it comes to a clutch I like classic so I would pick sycamore and willow. Easy for me – Beech and Elm. Love those 2 together. I’d use Elm & witch Hazel. The Mapke and Birch are fabulous! I love the idea of working with the little loom–ideas are blooming. I’m not normally one for subtle colors, but I think Sycamore and Willow would be so elegant together. Thanks for this lovely giveaway! would love the colors maple and birch. have always had an interest to learn weaving. I’d use maple and birch. It would be subtle and go well with my wardrobe. I love blues, so Beech and Witch hazel for me! Willow and Birch would be my choice. I think Birch and Maple. Madder and Sycamore – perfect for the summer! Beach and Balsam! Hard decision, all the colors are beautiful. This reminds me of all the pot holders I used to make as a child. Love the idea of the purse. What a great idea – I know I would enjoy this. Probably the Sumac and Maple, but I’d have to think on that some more. How do you choose – they’re all beautiful! I would like to weave with Witch Hazel and Hawthorn. Of course any of them would be great! I have wanted to play with weaving for quite some time. I would go with balsam and beech. I love the names of these colors as well as their soft tones! I think Sumac and Balsam would be lovely together. I think it would be beautiful in balsam and sumac. I would like Willow and Beech, please. Witch Hazel and Beach, going for a denim-ish look! I would like to try a combo of Madder and Sumac or White Pine and Cypress. All the colors are beautiful so hard to choose! I would like the cypress and beech. Great opportunity to try something new. Elm and Sumac would make a great spring combination! I would love red and white! Looks like a great way to use up left over yarn. I have lots of it! Willow and Sumac, to maybe modify it for a phone sleeve. I would use witch hazel and beech. Thanks for sharing info on weaving! I’d use Beech and Witch Hazel–goes with all my outfits! I still have two small vintage Weave-It looms my grandmother used to weave afghans for all her grandchildren, and of course, the afghan she made for me in shades of red and pink. She also cross-stitched designs on some of the squares. I’d love to use Beech and Hawthorne. Balsam and Sycamore would be my color choices, although any of the colors would be delightful. Such beautiful neutrals! Willow and witch hazel should provide a nice contrast AND I love blue. But why limit this to only two colors? Adding a little green, maybe for connecting the squares, feels right. Orange and purple for Zing!! Willow and White Pine. It would make a ‘dressy’ clutch! I think I’d go for Hawthorn and Sycamore. I love purple shades with gray. I have been wanting to try this for some time. I would love to make this clutch in Cypress and Sumac. It would be a wonderful pop of color for the gray days in the Pacific Northwest. Definitely Cypress (3524) and Sumac (3560). I would love to have the opportunity to use these colors to make the Pin-Loom Clutch! I’d use balsam and sycamore. I love these subtle shades! Willowand birch would look,lovely! but it would be fun to experiment with so many colors! I would love willow & white pine. Beech and Witch Hazel to match my denim jeans! I’d love to see how Witch Hazel and Elm look together! Beautiful colors! Hawthorn and Sycamore would look wonderful together! Sumac and maple would be the colours I would use. Might be easier to see what I’m doing with the contrasting colours. Madder and Birch for a vintagey feel! I would like Beech and Witch Hazel–but it is a tough choice! I love the idea of weaving again. I haven’done it in years. I would use cypress and elm to make the clutch. It sounds like fun. Weaving is fascinating to me, and now that’s its “little”…its even more interesting! I would use Willow and Sycamore so I wouldn’t have to change bags to match my outfits. TIME IS SCARCE! I’m old! More time for the great grands! I love Cypress and Elm. I think they would make a cute clutch! Cypress and Willow would look fantastic together! I would choose Elm and Sycamore for my first project. After that I would use up my left over yarn. What a fun way to clean house! I love the combination of hawthorn and sycamore together! What a lovely yarn and a great giveaway! Definitely Beech and Witch Hazel. These blues will go nicely with my denims. Beech and Birch . It would be a nice way to check out this yarn. Thanks for the chance. I’d use balsam and sycamore. Live the subtle shades! I think it would look cute in madder and sycamore. I’d use Sumac (#3560) as the main color with Willow (#3570) as the accent shade. I’d use Cypress and Sumac for a fun spring project! Beautiful palette. My first would be willow and hawthorn. Cypress & Balsam — orange is my color in all its shades! Sumac and Willow call out to me! Sycamore and witch hazel! These look like fun projects to learn weaving. I love the thought of using Cypress and Hawthorne to make the clutch. Thank you for the great ideas! I would use Sycamore and Willow for a classic look and because all of my dress shoes are black! What fun! I have not used a loom since I made my last potholder. I would thoroughly enjoy winning and experimenting with this loom alongside my daughter. She has turned up her nose and knitting and crochet and this might be the way to get her intrigued by fiber art. I would start with beech 3544 and elm 3532 to create some woven magic. Oh my, so many choices of delightful color matches. I’m kinda torn between cypress and maple or madder and hawthorn. I guess I’ll just have to buy some additional yarn just to be able to enjoy the colors. Madder and Hawthorn would make a very soothing color combination. What a lovely prize! My favorites are White Pine(3501) and Birch(3503) for a subtle and classy clutch for the summer events. I’d use Elm and Cypress but really all the colors are great! Would love to see this done in Elm and Sycamore. I like Sumac and Birch. Thank you! I would birch and elm. All the colors are so lovely and soft. I really want to learn to weave. I have so many little balls if yarn. It wild lulls be great to use them for something. Thanks! I would weave something in Elm and Balsam. I’ve had a Weave-It loom for over 50 years and every so often I get it out and make something. This would be a new craft for me! I love making prayer cloths and I’m thinking these little squares would be perfect for this…along with the clutch, too! I love shades of purples and oranges! Thank you! Ooohh! I would love elm and Hawthorne! The colors match dishes I’ve had since I was 16 and that’s over 40 years ago! Oh my! I would love to take up weaving! I would use Birch & Hawthorne. I would like to make the clutch for my adult daughter out of Willow and Beech! Thank you! I’ve been wanting to try the weaving experience and this hits that urge. I probably would like willow and birch. White pin and willow because nothing in this world is black and white. Always shades of gray thrown in to balance things out. Only two colors? If I have to narrow it down I would say Willow and Madder. My practical side would use Elm and Sycamore, but my more colorful side would use Sumac and Hawthorne. So many good colors! I think I’d choose Hawthorne and Madder. I’d love to try weaving with Elm and White pine! Thanks for giving me the chance to win. Sycamore and Willow would be my choice. I love that pin loom! Great clutch! I would use beech & witch hazel! I would like to try beach and witch hazel. It would be fun to try out a new project like this! What a wonderful way to use up yarn left over from projects! Or new ones would be nice, too. I would choose beech and white pine. I like the tonal look of Willow plus Sycamore. I had a loom like this in the 50s. I would like the Elm and Hawthorn. They are a great combination for a shawl. Looks fun. I would probably choose Cypress and Balsam. Thanks for the chance to win! Nice giveaway offer! I’d use white pine and hawthorne….maybe. Love that you mentioned we could change our mind if we win, so many choices! White pine and willow I think…..mind is thinking what that might become. Never used a loom before, but it looks interesting. I would go with Willow and Maple. This would be a fun, different project. I would use cypress and beech. I love shades of orange and blue together! I always wanted to try weaving, but the large looms are intimidating. This is a great introduction. Although I am partial to greens, Birch and Maple look like a terrific combination for a project. I love Elm (3532) & Willow (3570). Just getting ready to retire and this would make a wonderful project. Would love to win this and dip my toes into this weaving pool! Would use willow and sycamore with a dash of sumac for a purse. A hard choice, all the colors are lovely!! So exciting! I’d like witch hazel and sycamore. Hawthorne and Sycamore. Very pretty. I would chose Beech and Witch Hazel. I would use Balsam and Cypress! I would use willow and beech. I would also like to make a sock yarn blanket with all the leftovers I have. I like Sumac and Willow! So hard to choose just two. I would like to use Beech and Witch Hazel. I would use Willow and Hawthorne. Looks like such a fun project! I love the willow and madder colours. Been thinking about trying looming so this would be great. I love purple yarn–Hawthorne and Madder. I like Artisan and Folio. Purple is my favorite color. I would love to win this little loom! My colors would be hawthorn & madder. Thank you! I’d love to learn to weave. I like madder and white pine. Thank you for the giveaway. Elm&Beech would be my choice of Cotolana yarn. I would love to weave in madder and Hawthorne colors. I love your yarn and patterns. Thanks so much for the give away. I would love to make a navy and red combination! Always wanted to try this! I would use Beech and Sycamore so I could carry on casual jeans day. I would love to weave something using Sumac and White Pine!!!!!!!!!!!!! Cypress & Sumac, a bit Bollywood! Uh-oh, I feel a new craft coming on…. I would love Beech and Sycamore. And that clutch is too cute! I would love to use Willow and Cyprus for my colors. This would be a great addition to my Triangle Loom my husband made for me. I love weaving on the loom but this would be more convenient. Love it. Willow and Hawthorn would make a lovely clutch for someone special I know!! Cypress and White Pine! I’ve always wanted to try weaving. I would use Cypress and Birch. All of the colors are so pretty! Thanks for the giveaway! I would love to weave something in black and white. Reminds me of when I was a child and made pot holders. Willow and Maple sound good. I would use Elm and Hawthorne. It looks like great fun! I love that you named the colors after trees! Balsam and Birch would be my choice for a woven project. Beech and sycamore would be my choice for this great clutch. I have been thinking for awhile about learning to loom but have hesitated because of the investment in equipment. Would love to win this kit. Sure to get me started on a new adventure!! I love birch an maple. Wow! What a new idea for me as a long time knitter to try weaving without the large investment of bigger looms. I love this! As for colors, I would choose sumac and beech. Thanks for a great new idea! Maple and Hawthorn would be my pick. Thank you! Beech and Hawthorne. I’ve been wanting to try weaving … would love to try on a little loom. Love the Cotolana colors! So hard to choose. Sycamore and Willow would make a lovely clutch. White birch & willow. I’ve been wanting one of these looms for a while. Looks like a good way to use thrums. Maple and Witch Hazel, I think. Looks like fun! Wow!! What a great giveaway!!! I’ve always wanted to learn to weave!!! And so many pretty colors of yarn!! I absolutely love the colors Maple and Balsam!! Thank you for the opportunity to win and good luck to everyone!!! I would use Willow and Sycamore. Beautiful range of colors throughout. I’d like to see Cyprus and Sumac together. What a fun giveaway!! I would use Balsam and Willow because they remind me of the sea glass I pick up on vacation! Wow! Would love to try this. I would be wild and combine cypress and sumac to match the latest colour of my hair 🙂 I actually think it might be a pretty combination and outside my comfort level which tends towards browns and greens. Thanks for the great contest. Fingers and needles crossed! I would use witch hazel and hawthorn. I would probably use Sycamore and Sumac. I’m partial to pinks and grays. I would use Beech and Willow ! Witch hazel and white pine—but all the colors look good! This project would be so much fun! Sycamore and Beech would be my colors. I have never used a loom, but I do save my “bits of color” and always wonder what I could do with them. Thank you for a chance to find out. Willow (3570) and Cypress (3524) would be my color choices if I were to win this giveaway. Balsam and Beech. Thank you very much. I have fond memories of using little looms as a child. I would use willow and birch. I really like maple and birch and think they would make a lovely clutch. Can’t wait to try it out! I love the sample colors together. Would love to learn how to weave! Thank you for the opportunity. I think Balsam and Beech would look very pretty together. Thanks for this contest! I love the look of Willow and Witch Hazel. I’ve always wanted to try weaving! I love the little loom and have wanted one for some time. Elm and White Pine would be the colours I choose, thank you! Cypress and Sumac. Pop of color combo for spring/summer! I would love to try it in Sumac and Hawthorne. Becch ( of course ) and Hawthorne for me, please! Beech and Hawthorne for me , please! Madder is my favorite color, but I’d put it with either Elm or Birch. Sumac seems a little too much for my taste. I’d love to share the pin loom with my daughters, too. Hi Maria! You’re one of our winners of the prize package—please check your email! I think id go for Sumac and Hawthorne – but what a tough decision! Beech and Witch Hazel would be pretty too. Oh my word!! The balsam and birch, but all the colors are gorgeous! Balsam and Maple – a great combination. Beech and Elet would be fun. One good thing about small weaving you can take it on the airplane any where in the world. I like Cypress and Birch together. I would use Balsam and Sycamore. Thank you for the opportunity! White pine and madder – thanks! So many possibilities ! I think birch and hawthorn would bar great. Wow….any color would be great. I would love to try the birch and maple!!! I think the Sycamore and Hawthorne would be nice together! Thanks for the inspiration! I’d use Beech (my favorite tree) and Willow (my favorite dog) :-). I remember the square loom from when I was a child. I believe I made a blanket for my doll carriage. It would be fun to revisit that experience with my granddaughter. My color choice is white pine and beech. Thank you. However, whatever you are gifting would be quite wonderful🌺 Thank-you for showing us this loom. I would go with beech and maple. Im thinking Willow and Beech–sort of elegantly casual . Brings back memories, still have the little square loom my grandmother gave me over 55 years ago. I would love a little kit, I’m always happy to learn new skills. I would use in berroco cotolana balsam 3523 and maple 3510 to weave the little clutch, it would look really earhty. Sumac & willow. Have wanted to ret weaving for a long time! I need another yarn obsession! I love purples so I would choose Madder and Hawthorn together! Hawthorne and Sycamore please! 😀 Thank you Berroco and Schacht! Balsam and Cypress would be my choices. I tried my hand at weaving many years ago and set it aside when space became an issue. I love the idea of getting back into it with these little looms. Tough choice! Probably Beech and Witch Hazel, with a White Pine accent.. It would be a perfect accessory to my staple spring / summer wardrobe! Maple and birch would be lovely. Thank you! I’ve never weaved before just knitting. It looks like it might be fun. I like the madder and Hawthorne colours. Soft and muted. I like the white pine and willow yarns together for the purse, although the witch hazel is my favorite color of this yarn. Looks like so much fun! I would choose Cypress and Hawthorne for my project. Thank you so much! Hawthorne and Sycamore please! 😄 Thank you Berroco and Schacht! I’m leaning toward Hawthorn and Elm, a combo that evokes spring leaves and blossoms. What a wonderful idea!! I would love to use Madder and Elm I will make a perfect little purse for my mom, who can’t get out of the house much anymore. This will brighten her day. Thanks so much! I would choose Cypress #3524 and Hawthorn #3548. I am a tatter (and rigid heddle weaver) who has been eyeing pin looms for over a year. Fingers crossed! I think I would love this; I’ve always been curious about weaving! Sycamore and Willow please and thank you! Balsam and Beech would make a really lovely project, I think! Thanks for this opportunity! I love all the Berroco yarns! Looks fun: my colours would be Balham and Witch Hazel, which sound like they should be good for me not just good colours! My first project will be in Witch Hazel & Birch, these are easy colors for spring and summer. Thanks for a chance to win and for the great ideas too. Pink and Purple please. Will be great to make fashion “Patches”. I think Hawthorn and Elm would be a Springy combination. Would love to win this kit! Balsam And Birch would make a lovely clutch! Witch Hazel and Beech…wouldn’t that be so cute? I love the idea of making these little squares but didn’t realize they could become something practical and super cute. Thanks! Bright, warm colors of White Pine & Cypress make me happy! I have been wanting one of these little looms for awhile. Beech and Witch Hazel would suit me just fine. Thanks! Madder & Birch would be fun for spring! I love the subtlety or Maple and Birch, but they are all lovely! Beech and elm would make a lovely combination. The kit is definitely a winner. Beech and Witch Hazel – thought the choice was difficult as there were so many lovely options. Thanks! I would use beach and cypress together for a colorful treat. This is perfectly timed. My daughter and I just started learning to weave. Willow and cypress would be nice together. Witch Hazel and Sycamore for sure!! I would use Sumac and Elm to make the clutch. Such pretty colors! I’d probably use Beach and Maple. Thanks for the chance to win! I love pinks, so Sumac and Madder would make a lovely combination! Also, I am intrigued by the pin loom – I am familiar with many types of looms, but not the pin loom! Beech & Maple– the sea and wet sand, memories of beach vacations, in season everyday. I’d like to try Beech and Madder. I love small projects like this. I would love to add weaving to my handicraft repertoire! This little clutch will look stunning in Hawthorne and Sycamore. balsam and sumac, I have most of my clothes in greens and pinks. Beech and witchhazel, I think…I’ve changed my mind three times in the last few minutes!! They are all beautiful. I love working on my vintage pin loom while riding on long trips. Cypress & Birch would make a great combination. I think Birch and Maple would be a nice summer neutral. Thanks for enabling us , once again! I also recently saw a post from The Woolery in Kentucky about visible mending with these squares. So many possibilities from such little squares! Hawthorn and Willow would be my choices! Thank you! Sycamore and Madder would be my choice. Thanks for this opportunity. As most everyone else the Willow definitely. The Cypress too. Thanks for this giveaway. Beech and White Pine. It’s so hard to find a purse in a classic blue and white. I’d use Willow and Sycamore — dark neutrals that go with everything! I’m into spring colors right now, so I’d use Cypress and White Pine. 🙂 Love the clutch pattern! Squee! Maple and Birch, please! I would use birch and madder. Pink is in this summer and combines nicely with brownish colours. Thanks! So hard to choose; all beautiful colors, but I think I’d use Elm (3532) and Hawthorne (3548). Beech and Sycamore. Love those colors and I really hope to win. Willow and Hawthorn would be my pick. Love the idea of a portable loom. Can think of dozens of projects already. I would use Witch Hazel and Beech, which I think would make a lovely clutch. A small loom using knitting/crochet yarn is a great idea. I like that there is also a magazine since I find pictures are a great help with new projects. I love the hawthorn and balsam colors. Thanks! Cypress and birch, looks fun! The Birch and Maple are wonderful colors. I have always wanted to learn how to weave. I love the Sumac and Madder, but any of those colors would be great to work with. I would use Elm and Hawthorne for a beautiful combination. I would love to give it a try in Cypress and Sumac! I would use Birch and Witch Hazel for a sand and water beachy look! Thanks for the chance to win and try this out. Birch and Beech would be fabulous. Thanks for offering this valuable contest. Loved making potholders 60 yrs ago so have been wanting to try this! Hawthorne and Elm! And a whole new world of creative possibilities with this little loom…! I would personally use elm & witch hazel! Maybe with a pop of madder or birch too. I would use pink (Madder) and gray (Willow). Thanks! How fun! Beautiful colors. Balsam and hawthorne would look lovely together. I’ve never attempted weaving, but this appears to be a great way to dip into the weaving waters. I would enjoy weaving the clutch. The fabric is beautiful. I’ve been experimenting with two colors held together knitting a blanket. I would very much weaving fabric in Sumac and Elm and sewing the clutch together. Finding the right button will be fun. Balsam and Sumac look great! This would be super fun to try!! I would very much *enjoy*weaving fabric…. I would love Willow & Sycamore–they’ll go with just about everything! I have a picture of me as a child in my Weave-it squares coat my mother made me.. I’d like to try it. Willow and sumac might be nice! Thanks for the opportunity. I forgot to add my color choice: Hawthorne and Sycamore. Thanks! Maple and Beech would be lovely colors to weave the clutch. I think I would use Balsam and Hawthorne. White pine and birch – love this! Always wanted to try weaving and this seems like a great way to test the waters. I’d like to see Sumac and Sycamore together. Used to do pin weaving alot when I was little! I think it would be fun to do bright colors for spring – greens and yellows. I would probably use Cypress and Willow. I would use Birch and Maple. Sycamore and sumac — perfect for my wardrobe or a relative’s if I can bear to give it away! Spring always make me crave greens so I’d love to try weaving with Elm and Balsom. This looks like so much fun to try! Beech and Sumac are the colors I would choose. Great giveaway! I love the Hawthorne and willow. Am very interested in learning to weave. Would love to try weaving!!! So many possibilities for creativity. Earthy colors is what I would prefer but always open to something new and different. Hawthorn and Madder for a summer blend! I’d try the clutch purse. I’d love to start weaving. My choices would be balsam and sycamore. My choice would be white pine and balsam. Cypress and Witch Hazel are the colors I’d choose. I would use White Pine and Birch. I haven’t done any loom since made potholders as a child. It would be grown-up fun to make that pretty clutch. I’d love Beech and Balsam. What a sweet clutch! I’d choose Maple and Balsam. Beech and Witch Hazel would look great together! What a wonderful hobby. I would use Hawthorne and willow for the clutch. I would use Beech and Witch Hazel. Hmm I’d have to pick sumac and hawthorn, so delicious. All gorgeous colors! I would choose maple and balsam. I would use Elm and Birch. I think the clutch would look lovely in Cypress and Elm. I would use Beech and Witch Hazel for the project. Lovely yarns! Beech and Sumac would be nice. White Pine and Witch Hazel for me please! I’m drawn to Beech and Willow. Love the darker colors! I’d like to see sycamore and beech together in the project. I’m a simple girl. White pine and maple are my choice! White Pine and Beech. Perfect for summer. Weaving sounds interesting. Would love to try it. If I win, I would love to have Sumac 3560 and Hawthorn 3548. Thanks. Beech & White Pine! Love my blue & white. I would use Beech (3544) and Birch (3503)… those two Colors would make a great combination for the summer clutch! This prize is awesome…. I would like to be surprised !! White pine and beech, and I think I’m going to take my daughter’s Cricket loom out to play…. Willow and beach for me too! perfect project for my spacial talented granddaughter and I to try together….colors white pine and sycamore please to start with. I really want to try this loom! I would use Sumac and Sycamore. Thanks for the chance! I would use sumac and willow. I love the neutrals….Birch and Maple would be perfect! But it might be a fun little project to branch out and sample colors with too! Witch Hazel and White Pine would be my choice. would love the sumac and willow – gorgeous colors! Cypress and sumac to remind me of sunset colors. Love the idea of being able to quilt with yarn! I would like to try Sycamore and Willow to make the clutch. I love the lightness if balsam and birch. Beech & Sycamore would be my choices but they all would be beautiful! I would love to learn to pin weave.. how exciting!! I would pick the CYPRESS and ELM!!! I think balsa and white pine would look lovely together. I’ve been joking for a Zoom Loom for a while now, plus it’s my birthday! Happy birthday Helen! You’re one of our winners—please check your email. Willow and Sycamore would look great! I choose hawthorne and madder. Hawthorne and Cypress! My Clemson colors! Hawthorn and Witch Hazel. Colors are beautiful! I’d use Beech and Sycamore. What a fun way to begin learning weaving. I really like Balsam & Elm together. I love Madder and Willow, and maybe add Hawthorne! Lovely soft colors. Hawthorne and Balsalm would be my picks. Lovely yarn! I love birch and maple…would go well with my driftwood distressed furniture. I have knitted and crocheted for over 50 years and am always eager to learn new skills. I would love to learn weaving and would use Cypress and Sycamore. I love Madder and Willow! Maybe I would add a little Hawthorn myself, to have some leftover of course. Lovely soft colors. Oooooo, Cypress and Willow. I do love orange so much. This reminds me of the countless potholders I made my mother as a child. So much fun. This is a much more ‘upscale’ and ‘adult’ version. Maple and Cypress! Want to give weaving a whirl! I think Madder and Hawthorne would look nice. Thank you! I would use Hawthorn and Beech for my clutch! love little looms so many great ideas…willow and birch would be great pair. thx for having a contest! Sycamore and Willow…i think they would combine to make a nice evening clutch, but I’d use it during the day too! I would use Balsam and Birch for a lovely earth-toned clutch. I love Willow and White Pine – they would look so amazing together!!! I remember my grandmother trying to teach me to use a small homemade loom when I was very little – would so like to learn again!! Hawthorne and birch. Looks like fun. I would use white pine and sycamore for a graphic, yet sophisticated, look–perfect for a night on the town. Looks like a fun project! I would use green and gold. Those are our colors for the Green Bay Packers. I think this would be fun to go to the game with a clutch made of those colors. It would be real cool to make. I would love Willow and Sycamore together! So many combos that I’d love to try, but I think I’d probably end up with Beech and Elm for their versatility. I’m up for using Beech and Sycamore, but it wasn’t an easy choice! Birch and Willow? All are lovely! I’d use white pine and Hawthorn. It would great with the purple dress for formal night on our next cruise! Elm and white pine would be pretty. Balsam & birch would be lovely!!! Witch Hazel and Beech. Thanks! I’ve always wanted to learn to weave but was never introduced to a small loom like this….it finally came to me so perhaps it is time to learn…..
Hawthorn and Madder. It is fun to see the different combinations people are suggesting. Willow and Cypress. I have a top with these colors that I love. I would use Willow and Beech. Birch and Balsam are my choice … although I like all of these “organic look” colors. All colors are awesome. I would first try Sumac and Hawthorn. Thank you for a great giveaway. Love the Hawthorne and Sycamore blend. I would use Maple and Hawthorne! Balsam and Maple!! Would love to try it!! Hawthorn and Sycamore. What a lovely project! I would use Beech and Willow. What fun this would be for me and the grandkids!! I would choose madder and hawthorn! Right now, I’d use Balsam and Willow, but next week, who knows, all colours are so beautiful! Thanks for the awesome giveaway and I really hope I win! Wow, those are lovely colours, and I’m amazed at the creativity available through this little loom. I would start with Sycamore and Cypress, but love all the beautiful combinations available. Balsam and Elm!! A subtle color difference would catch the light at different times of the day and show a different overall color. This bag is great. I’d make it in madder and sycamore. I tried weaving on large loom but dressing it was too difficult for me. This would satisfy my weaving desire and be manageable. I love elegant dark colors. I would choose Willow and Sycamore for myself and I would teach my granddaughter how to weave using Sumac and White Pine, those are her favorite colors. Sycamore and Elm would fit with a somewhat neutral background for the colors I most often wear–with a bright contrasting flower pinned on for a daily accent! Love. Love. Love Hawthorne and Willow! Love it! I would use Willow and Balsam. Trying to decide between Witch Hazel and Sycamore, or Willow and Beech. Both evoke weekends in jeans, one a little more worn than the other. I would use white pine and Willow! Sumac and Sycamore – I love red! Thank you for this contest, the pin loom looks like so much fun! I would use Elm and Sycamore. These look like fun projects! Hi, I would choose Hawthorn and Willow, they are so pretty together. Thank you. Balsam and Witch Hazel make me swoon. Love that the colors are named after trees! I love witch hazel and elm …hope I win! This looks like a wonderful craft to learn, i would also love to teach my daughter. I would use balsam and hawthorn, i have always loved those colors together! Thank you for the chance to learn something new! I’d use Beach and Witch Hazel. I’m all about the Blues! I’d use maple and elm – mostly because I live on the corner of elm st. I would be making it for my daughter so Willow and Madder would make a classic combo. Sumac and Willow would look great togethet! Cypress and Birch. Two colors I haven’t used a lot. I think I would use White Pine & Sumac. I have wanted to try weaving for so long. This would be perfect!! Witch Hazel and Elm would make me very happy! Thanks for the chance to win this kit. What an intriguing little loom! I’d select Hawthorn & Sycamore. Beech and Birch. This would be an amazing addition to my craft addiction. Oooo, neat. I’d use Balsam and Maple. They’d look nice together, yet still be neutral(ish) for general use. I would use the clutch as a cover for my tablet (if it fits) in Beech and White Pine. Taught my son how to use a potholder loom a few years back. Would love something smaller I could use regular yarn with. I’d love Madder and Sycamore. I like Beech and Sycamore. Hawthorn and Sumac! So many pretty colors to choose from! My chose would be Willow and Sumac. I love the colors of this yarn. They are muted and natural looking; my kind of colors. I think I like the combination of Hawthorne and Witch Hazel, but there are oh so many more that work so very well together. I’d like to try witch hazel and beech together. Thanks for the chance to win!! I would like to play with witch hazel and birch. What fun! I think I could really get into these mini weaving projects! I’d pick witch hazel and balsam as the colours for the clutch. I chose willow and sumac because those are the colours I wear the most. I would love to do it in ELM and WILLOW. I love Birch and Sumac❤️! OOo, Beech and Elm for sure! Sycamore and Willow for SURE. I’d love to try this! Madder & Hawthorn! I had never thought about weaving because I don’t need placemats, tea towels, etc., but I had never thought about purses! Cool idea! Gorgeous colors! I would choose Witch Hazel and Sycamore. Reminds me of when I was a child and had a little metal loom to make potholders or hot pads with loops of material. I would use sycamore and willow to make the clutch. Thank you. Beech and Madder are calling my name. What a terrific idea! I would choose Beech and Witch Hazel. Although, in truth, all of the colors are terrific. Witch hazel & beech. I’d love to try the pin loom. I think Elm and Beech would make a great color combination! Thanks for the chance to win. Maple and Beech for me! I would put the Hawthorn and Elm together for this lovely bag! Balsam and Cypress! Awesome colors, really fun prize! Hope I win! Hawthorne and Sycamore for me! They’re all cool, but I think I like Madder and Sycamore best. This looks like a fun new hobby 🙂 The colors that I like are Hawthorne and Madder. Maple and madder would look lovely together. I would use Hawthorn and Beech. Maple and WIllow. Tres Chic. What fun! Willow and Beech for me. madder & balsam for me! This is a tough one! I would probably use Balsam and Birch or Sycamore and Willow. I would use Birch and Maple perfect for fall which is probably how long it will take me to do this if I win. Witch Hazel and Elm would be a lovely combination. I would use Willow and Elm. Sumac 3560 and Hawthorn 3548 would go with my Red Hat wardrobe. I’d use Birch and Elm! Birch and maple goes with most everything! Love all the other colors too. Reminds me of the old pot holders looms I had as a child! I would choose Hawthorne and Birch……I think, all so beautiful and reflective of nature. I do hope I win! I would use 2 denim blue shades to make those handy little purses for recreation times. Hawthorne and Maple would make a lovely fall clutch. Thank you! I would use maple and cypress for a nice fall clutch. Thank you. It’s so tough to only choose two colors, but if I must, I can see birch and maple as a great combination. Beech and Witch Hazel would make a great purse to go along with some casual jeans. Beech & Sumac I think. Or maybe make more than 1 with different colours. I would use Sycamore and Beech. I think I would try colors 3544 & 3506 – thanks for the contest! I’ve knitted with Cotalana before, and it is wonderful!!! I would love to try weaving. I would use Beech and Maple. Hawthorne and Maple! It also sounds like s nice corner for an LYS. Beech & sycamore. But so many other good choices too! Gosh, so many beautiful colors to choose from! I think I would go with neutrals like birch and maple to make my clutch. Thanks for this wonderful giveaway!! Maple and elm are my choices. Sycamore & Hawthorne would be just beautiful. Although Sumac and White Pine come in as a close second. Sumac and White Pine. Although Sycamore and Hawthorn are a close second. Hi, I would use white pine and willow .. This looks like lots of fun for me and my grandchildren ..never too young to fall in love with the beauty of yarn! I’d like to see how Hawthorne and Willow play together. What a cute clutch! I would like Will and Cypress. I think Birch and Cypress, or perhaps Elm and Cypress would be striking! Hawthorne and Elm are what I love as a weaving combination.